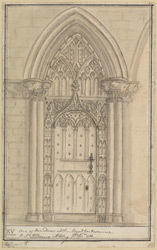 View of the West Entrance to St Albans Abbey, drawn by Thomas Baskerfield. This was the original entrance to the earliest part of the building on this site, an Abbey Church built in 1077 from flint and Roman bricks. It was Paul of Caen, the fourteenth Abbot who was responsible for this building. He wanted a large and impressive building which was larger than the Cathedral at Canterbury where his uncle, Lanfranc, was Archbishop. The Abbey was designated a Cathedral in 1877.